2017 marks the 50th anniversary of the end of steam on the Southern Region of British Railways. 2017 will also mark the return of ‘real’ – as opposed to heritage or tourist – services over the full length of the Swanage branch to Wareham after absence of 45 years. Using pictures from Britain’s top lineside photographers, the publication tells of the Herculean efforts to return regular steam haulage to the electrified lines in south of England, and also details the marathon efforts to rebuild the Swanage Railway, an iconic Sunny South line. However, not only does the publication include the finest steam railways (and tramways) along the south coast, like The Mid-Hants, Bluebell, Isle of Wight, Moors Valley, Volk’s Electric and Seaton Tramway, but the finest heritage lines in the west – the South Devon, Dartmouth Steam, West Somerset & Lynton & Barnstaple railways, and many more! 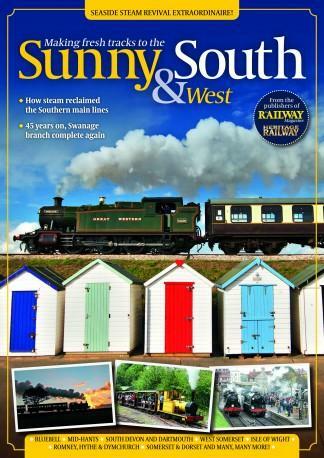 Be the first person to tell us what you think about Sunny South & West and you'll save £2.50 on your next purchase!